As a 2016-2017 Fulbright-Nehru scholar, my research and field work centered around education and performance of Western classical in India. During my nine months in the country, I explored the various ways in which pedagogical approaches, school politics, cultural perceptions, and community interests impact the growth and direction of the art form nationwide. My initial goal for my research was focused more towards studying Hindustani classical music and using my research to develop Indo-centric classroom music curriculum. However, I discovered that I could expand and enhance my research by also exploring Western classical music in India as a music educator, and engaging with instrumental and orchestral programs around India. I also felt compelled to interact with a wider range of students, educators and schools, in order to understand the work in a broader context and to decide how to direct my efforts. With every project, I looked for ways to help schools make Western classical education music more engaging, accessible, playful and inclusive. For example, through leading string ensembles workshops, I attempted to demonstrate the importance of playing together as an integral skill for any developing music student. 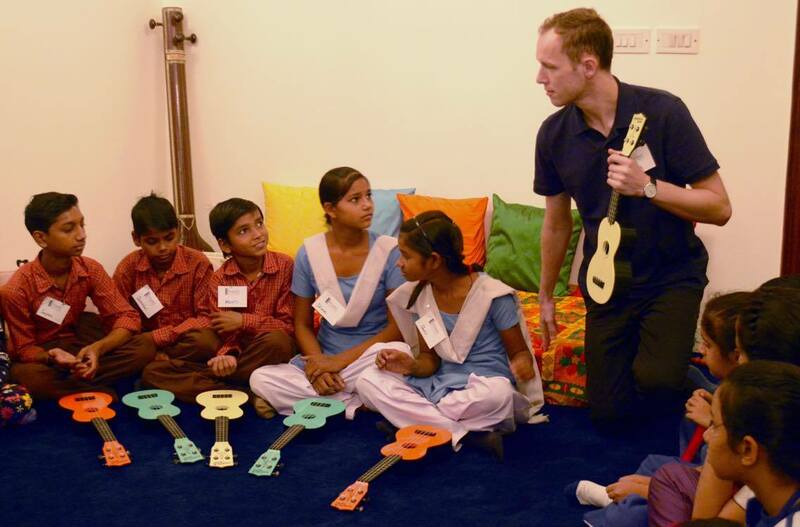 In collaboration with Sangeet4All, a Delhi-based NGO, I was a guest teacher at the Pragathi Wheel School in Noida and helped to launch a brand new ukulele program. Given my background in instrumental music education, I also developed curriculum concepts for a pilot ukulele program which targets the age bracket 8-10. Although structured in a Western style, this curriculum presents topics through an Indian musical lens using the sargam syllables and Hindustani rhythmic models, according to the unique philosophy of the Sangeet4All curriculum that is followed by the Shubhendra and Saskia Rao Foundation. One of the most meaningful aspects of my research was the field-work-related travel. As a music educator, I was able to engage with communities, students, teachers from across the country; it was so exciting to discover an upcoming generation of curious, eager, talented and highly motivated music students. My field work allowed me to visit and interact with the following schools and organizations: Mehli Mehta Music Foundation (Mumbai), Child’s Play Foundation (Goa), the Calcutta School of Music, The Kolkata Youth Orchestra and the Bangalore School of Music and a very special project with the India National Youth Orchestra. Collaborating closely with teachers and staff, I worked to share my expertise as a classically trained cellist, group ensemble coach and conductor. I also acted as a consultant and teacher trainer, sharing observational feedback, teaching strategies and educational resources like pedagogical methods and repertoire for student ensembles. With every project, I looked for ways to help schools make Western classical education music more engaging, accessible, playful and inclusive. For example, through leading string ensembles workshops, I attempted to demonstrate the importance of playing together as an integral skill for any developing music student. Through feedback, I learned that these workshops were very motivational for students as many of them had never played in an orchestra before, let alone in any size group. My experience with music in India was richly transformative in more ways than I can count. Especially as an artist and educator, I was able to make immediate connections and to form deep and meaningful personal relationships with students and teachers from across the country. I do believe that there is a bright future for Western Classical music in India! I was also lucky enough to volunteer with a broad range of community organizations involved in youth empowerment, education and human rights. I volunteered and/or interacted with Music Basti in (Delhi), Ektara School (Kolkata) and the Oxford Mission School (Kolkata). In addition to social outreach related to my field, I also had the opportunity of performing music in venues across the country, including performances at the American Center (Delhi), the Lotus Temple (Delhi), the American Center (Kolkata), the Russian Center in (Mumbai), the Victoria Memorial in (Kolkata) and Chowdiah Memorial Hall (Bangalore). These concerts were very rewarding as I felt that I made a strong connection with local audiences. I also performed many concerts for kids at schools and it was great fun sharing the cello with them. Indeed, as a cellist, my instrument is quite uncommonly seen or heard in many places around the world, so I felt like I was introducing the cello for the first time in many communities.